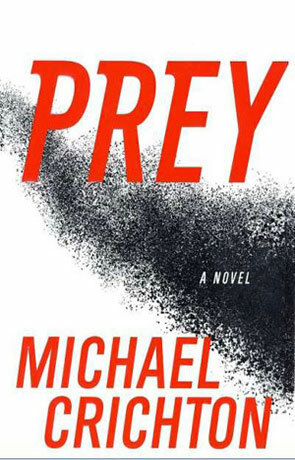 Prey is a science fiction novel by the late author Micheal Crichton. Micheal Crichton, the well-known author of Jurassic Park and The Andromeda Strain continues his long list of precautionary tales in his most recent novel, Prey. If you are familiar with Crichton's work, you no doubt know that he loves to mix in plenty of technological explaination and theory in all his novels. Prey, a techno thriller, delves deep into the subjects of distributed and nanoparticle technology. His diatribes can be long-winded at times but he always manages to supply enough peril and intrigue to keep you reading. The story is basically about an computer programmer turned house dad, named Jack. Jack is an expert in distributed technology but after blowing the whistle on his shady boss, he winds of fired and blacklisted throughout Silicon Valley. Julia, Jack's wife becomes the main bread winner of the family and heads up a top secret project for a conglomerate named Xymos. Most of the intrigue begins and ends with Julia. Julia is very wrapped up in her work and this sends up several red flags to Jack as he notices that she is less and less around for him and the kids. Her behavior has become very erratic and even her appearance has changed. Eventually Jack is offered a job as a consultant for Xymos. He's told that he is being brought in to fix some code for a computer program that he had help create in the past. Upon arriving on the job he discovers that the situation is much worse than advertised. A renegade cloud of nanoparticles have "escaped" from the manufactering plant and evolved into a predatory menace. Jack immediately recognizes the threat and makes plans to eliminate them but curiously, he meets a lot of resistence from the main plant supervisor. The threat continues to rise as Jack finally realises how far in over his head he's gotten himself. Prey is the type of story that hooks you in a page at a time. The sub-plot of Jack and Julia's deterorating marraige and its affect on Jack's emotions was very well portrayed. I quickly found myself tearing through the pages as I tried to figure out the the mystery behind the runaway swarm of nanoparticles and its connection to Julia. As a warning, I should mention that there is a great amount of foul language in the book. Crichton must've used the "F" word in all it's renditions over 100 times. It was a bit distracting at times. Overall this was an insightful look into technology and the damage it can cause when pushed to the limit by greedy corportations and left unchecked.